Illidan's brother, Malfurion, imprisoned him beneath Hyjal for 10,000 years. Stormrages are not good at letting go of grudges. Isn't here a Blind Rage achievement? Blizzard please fix this busted broken bonkers card already, why didn't you send this to hall of fame. This is what I wish I was saying about this card. I will never undestand why blizzard are not reworking legendaries like this one or any other that dont see any play. My first legendary in game. I remember how I tried to put him in every single deck I've played. I will never DE him. This guy is badass in WoW. All Blizzard would have to do is make him a 5/7 and he would be playable, that's just me though. A 4/8 would be even stronger. Almost no card at 6 mana has that powerful of a statline; I think it would be a solid legendary with a place in a lot of decks. It's hard to remove, trades super well (unlike its 7/5 counterpart, which is an unnecessarily aggressive statline) and generates constant value (especially for Jaina!). Sounds good to me! That would make him better like you said, but all I want is Illidan to be good and if he was a 4/8 he would most likely be playable. But if Blizzard really wanted to push Illidan give him a new Battlecry. One example is Battlecry : destroy a demon , this is because Illidan is well A Demon Hunter ,this change could help with the current Warlock situation in the meta. If they wanted to make it more insane then make it so he destroys a minion. 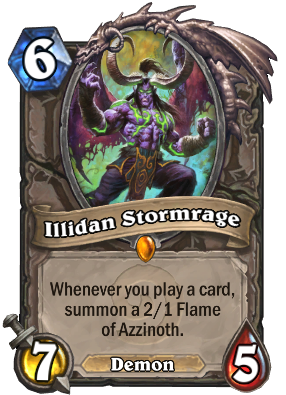 If Blizzard did this Illidan would become a very if not best 6 drop in the meta. I would prefer him to be a 4 Mana 5/4. Just a solid mid-range card. 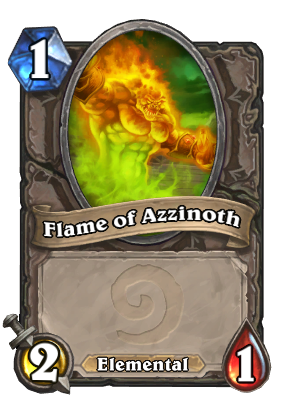 This card needs to be better, I mean its Illidan for f**** sake. Frost Lich Jaina synergy anyone? Well I have to say that Illidian saved me from death, it's token is suprisingly strong (and they are elementals so they heal me) and you can earn his tokens for simply playing the game combo with Fire Fly easly gives you a big advantage. EDIT 2: Also his tokens are perfect targets for Icy Touch! Would you send me your Deck please?